Sri Lanka's top cricketers are allegedly being honey trapped and blackmailed into match-fixing, the Sunday Times reliably learns, amidst unprecedented International Cricket Council intervention to, at the very least, reduce corruption in the sport here. The ICC is now investigating what they term "serious allegations of corruption" in Sri Lanka. Three players have been charged, including former Chairman of Selectors and top cricketer Sanath Jayasuriya. Jayasuriya was not charged for match-fixing but for concealing information--an offence under ICC’s anti-corruption code. Nuwan Zoysa-a former coach attached to SLC and a former international cricketer Dilhara Lokuhettige were accused of directly soliciting, inducing, enticing or encouraging a player" to fix or influence the progress of a match and failing to disclose approaches to "engage in corrupt conduct". For the first time in the organisation's 109-year history, the ICC this week announced a 15-day amnesty for cricketers and officials, starting on January 16. They are urged to divulge any approaches they may have received from fixers on the promise that they will not be penalised. 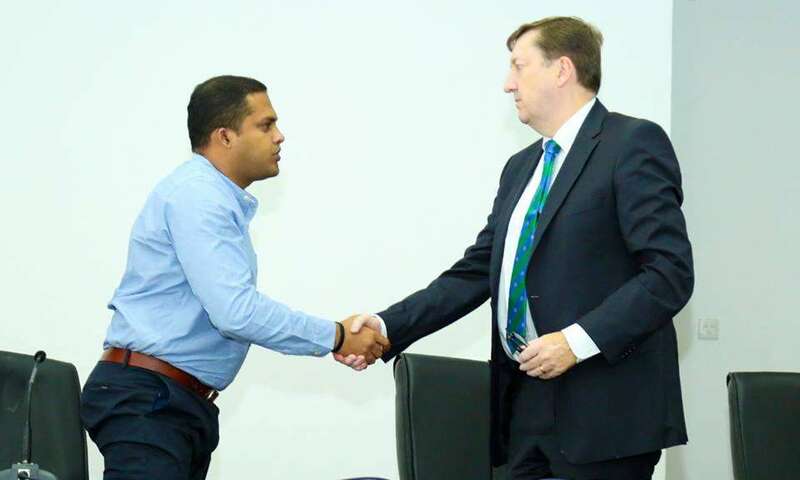 Speaking to the cricketers and officials in Colombo ICC’s Anti-Corruption Unit’s Coordinator of Investigations urged players to come clean by cooperating with the investigations. ‘Let me make this clear, this is not amnesty for corrupt people, people who have fixed matches,” Richardson told the players and officials at the Ministry of Sports. “This is for people who have been approached but turned it down and not reported it," he continued. “This amnesty will give you a chance to come forward and tell us. So who will you be reporting to? At the moment, there’s no anti-corruption unit in Sri Lanka. I am the anti-corruption officer in Sri Lanka Cricket. Therefore, you will be reporting to me. As the ICC anti-corruption officer, I will be the one who will come and speak to you.You can have confidence that you say to me will be dealt with in confidence. I have had many confidential discussions with people in this room, but nothing was reported in the media. Nothing at all." It remains to be seen whether victims of such a corrupt system are free to disclose this information for fear of retribution, given how deep the connections fixers have to both criminals and people in power. There is evidence, however, that some cricketers under investigation are caught in a honey-trap, an approach widely used by organised criminals around the world. Others, mostly young players coming into the national side, are asked to fix matches by those that wield authority to earn a place in the team. Last July, Sri Lanka opener Danushka Gunathilaka was questioned by Police after a Norwegian woman was allegedly raped in a hotel room while he was present. Police later confirmed that Gunathilaka himself was not under investigation even though he was linked to the alleged assault in the team hotel. Sri Lanka Cricket later slapped him with a six match ban for breaching the “Player Code of Conduct and Contractual Obligation’ twice within a 12-month period. In addition to the three charged at present, at least few other cricketers playing at various levels and who are being investigated for corruption allegedly have links with a woman in Colombo. The Sunday Times learns she enticed the players, later introducing them to a prolific match-fixer in India to seal the deal. Information about these persons, including their photographs, have been disclosed to players to educate them about their activities. Investigations started in 2017 after Sri Lanka lost an ODI series to Zimbabwe at home (2-3). The manner in which the home team got defeated was publicly questioned by many former players. As a means of tackling the menace, match-fixing laws are being formulated entailing towering fines and prison sentences for those found guilty. They are expected to be passed soon but legal sources insisted that Sri Lanka must change the archaic Sports Law and Sri Lanka Cricket's (SLC) constitution as a matter of priority to stop corruption eating away at the sport's administration. Harin Fernando, the new Sports Minister, made it his priority but did not have the blessings of the ICC to get it postponed-within which period he had hoped to change the SLC constitution--before conducting the cricket election. ICC had earlier granted two extension to Faiszer Musthapha, the former Sports Minister. This sabotaged Minister Fernando's plan to introduce a constitution tailored to stop vote-buying and manipulation, thereby--hopefully--preventing people with vested interests assuming power over cricket administration. Politicians sell the country. Players sell the matches... What's wrong... ?? ?